Arrival in Buenos Aires. In the afternoon you will visit the district of Palermo with its beautiful parks, artificial lakes and its trendiest neighbourhoods Palermo Soho & Palermo Hollywood. On optional basis you can book an Argentina culinary experience (on shared basis). Enjoy a sightseeing tour through Buenos Aires visiting La Boca and Recolta and taste a cup of coffee & snack at famous Café Tortoni, the oldest literati café of the city. In the evening visit a tango show with dinner (on shared basis). Day at leisure. On optional basis you may discover the Tigre and Delta of the Parana River or the countryside visiting estancia Santa Susana or the San Telmo Antique Fair (on shared basis). Once arrived in Iguassu guests visit the Argentinian Side of the Iguassu National Park including the Devil’s Throat with the highest continuous fall. Wonderful sights include rainbows straddling clouds of spray, screeching green parrots flying across the waters and colorful butterflies hovering over lush greenery. The afternoon is at leisure for own activities. Visit to the Brazilian side of the falls with views of the full scale of the cascades. The afternoon is at leisure for own activities. 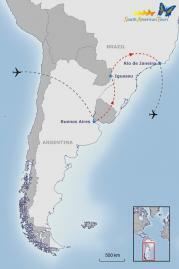 Flight to Rio de Janeiro. Rio is without a doubt one of the world’s most spectacular metropolises. Stretched between forested mountains and the sparkling Atlantic, it is a city of long golden beaches and an exuberant cultural life. Full day city tour to visit the main sights of the city inclusive visit to the Sugar Loaf and the Corcovado mountain with the Christ statue. Optional: Rio by night - Samba Show.